Nero 2014 Platinum is a multimedia software suite that lets you capture, convert and consume your movies, music and photos for the best HD home entertainment experience. Nero Platinum was built to support Windows 8 and provides the best experience for enjoying Blu-ray Discs. With Nero Platinum, it is fast and easy to achieve the results you want by working seamlessly across the applications in the suite. Nero Platinum supports the latest video formats and has everything you need to convert, edit, burn, stream and enjoy your movies, music and photos in high-definition. Avoid the hassle of recreating photo albums, slideshows or music playlists to stream on different devices in your home. With Nero Platinum, create them once and then stream them to your XBOX 360?, PS3?, iPad®, Android tablet, PC, digital media adaptor, streaming-enabled TV, or other DLNA- or UPnP-supported devices. Forget the hassle of using different players for your video and audio discs and files. With Nero Platinum, you get one media player that can simply handle everything. Import, edit and export videos in AVCHD? Progressive (50p/60p) format. Quickly output it with SmartEncoding. Rip it to virtually any other video file format. Nero Platinum lets you do just about everything with your high-definition videos so you can enjoy them on any device. AVC/264, MKV, MP4, 3GP, AVI... there's hardly a video format or codec around that Nero Platinum doesn't support. Spruce up your home movies with 800+ easy-to-use video effects, templates themes and disc menus. Now with Nero Platinum, stabilize shaky videos from your smartphone or handheld camera. Add a touch of nostalgia with brand-new film-style effects and retro film themes. Create Hollywood-quality Blu-ray Discs? or DVD-Video? discs, complete with menus, navigation, graphics and text. Get around to that project you've always wanted to tackle. Convert all your analog movies to Blu-ray Disc?, DVD or virtually any file format so they continue to keep pace with your playback equipment. From financial records to irreplaceable photos, it's a snap to make sure all your most important data is backed up routinely and automatically. Now, back up to hard drives larger than 2 TB and the latest-generation USB 3.0 storage devices. Plus, automatically discover and configure your NAS device for a network backup or backup your data to the cloud. Make professional-looking disc covers and labels. Mix your own music tracks and edit audio files exactly to your liking. When you upgrade to Nero Platinum, you can download Nero CoverDesigner, Nero SoundTrax and Nero WaveEditor - all for free! With hundreds of performance improvements ranging from hardware accelerated video encoding to a split installer that lets you get up and running in 5 minutes, it's never been faster or easier to get exactly the results you want than with Nero Platinum. With the greatly improved Nero Kwik Media library at the heart of Nero Platinum, it's never been easier to work across applications or faster to find and use exactly the photo, song or video clip you want. Don't make the leap to Windows 8 without Nero Platinum or you may lose out on DVD and Blu-ray Disc? playback on your PC, DVD recording and TV capturing. Thinking of waiting awhile before you upgrade your OS? Not to worry, Nero Platinum works perfectly on Windows 7, Windows Vista and Windows XP, too. 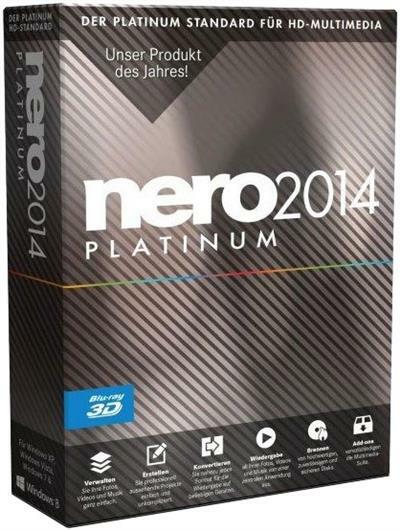 Nero 2015 Platinum 16.0.04200 Final Retail from rapidshare mediafire megaupload hotfile, Nero 2015 Platinum 16.0.04200 Final Retail via torrent or emule, full free Nero 2015 Platinum 16.0.04200 Final Retail, Nero 2015 Platinum 16.0.04200 Final Retail rar zip password or anything related.